Wakefield garage doors & openers | Mclaughlin Roof Trusses Ltd.
Garaga: the top canadian garage door manufacturer! At Mclaughlin Roof Trusses Ltd., we’ve been in the construction business since 1977. Our family-owned business has developed a garage door and door opener division for residential, commercial and industrial uses. Because quality is essential in every project we undertake, we carry Garaga garage door, renowned for their superior line of products. Garaga, the top garage doormanufacturer in Canada, makes the most solid, best insulated door systems on the market. With their wide range of garage door models and colours, you’re sure to find the one to fit perfectly with your home’s design. Visit our image gallery to see more than 130 different looks! Come to our showroom to see our products up close. With a full array of samples and in a relaxed atmosphere, we can guide you in this important purchase. Would you like to have the price of your garage door project? If you would, complete our online quotation form today! We will answer you promptly. The biggest moving part of your home is, surprisingly, your garage door. For that reason, your garage door opener has to be strong and dependable, day in and day out. At Mclaughlin Roof Trusses Ltd., our staff can give you advice in selecting an appropriate garage door opener to meet your needs. Because we’re dedicated to quality, we carry LiftMaster as our door opener line. Made by the Chamberlain Group, they are the longest-lasting garage door openers. By prioritising safety and security, LiftMaster has become the top-of-the-line brand on the market. See our complete line in our door openers section and learn more about their various features. They can be installed in residential, commercial, industrial and agricultural applications. Providing personalized service and superior quality products is what sets us apart from our competition. To ensure the correct operation of your garage door system, it has to be properly installed. Our experienced and well-trained technicians can provide this service for you promptly. Does your garage door need to be fixed or replaced? We can expertly handle these services too. With many trucks on the road, we can rapidly get to your home or place of business and resolve this undesirable situation. We also sell replacement parts such as cables and springs. Schedule an online service call today or contact us at 1-800-605-0033. We cover an area of 160 kilometers around Wakefield including Woodstock, Somerville and Hartland. It will be a pleasure to serve you. About Mclaughlin Roof Trusses Ltd.
Who are we at Mclaughlin Roof Trusses Ltd.? 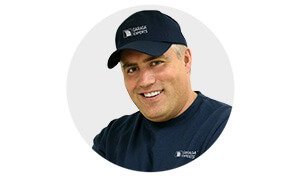 Your GARAGA Garage Door Specialist in the Woodstock area.